Made right after the end of the second world war, My Darling Clementine (John Ford 1946) is, among other things, about building a community and look fresh towards the future after a necessary exorcism of demons, internal as well as external. Part of that optimistic, forward-looking process is the building of a new church in Tombstone, and how the inauguration of that church, not even half-finished yet, is linked with the emotional development of Wyatt Earp, dancing with his lady fair, as the old-timer says. 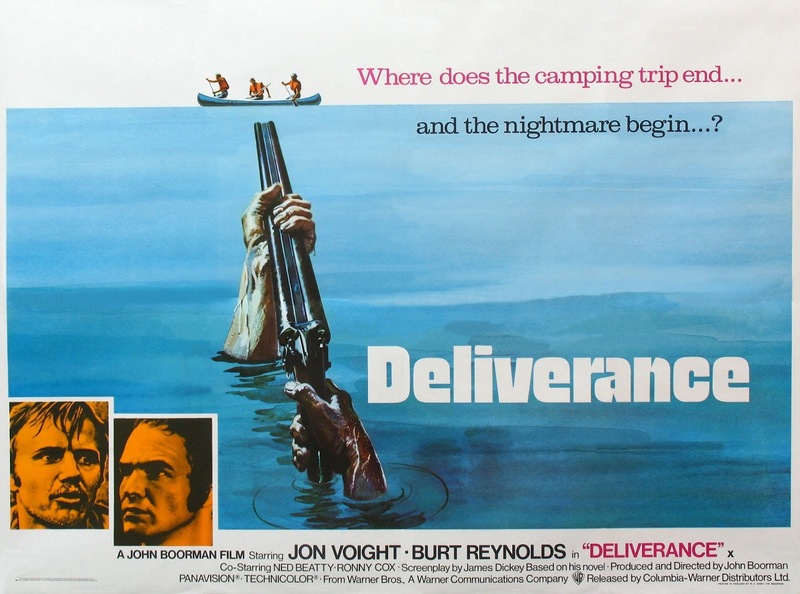 I have always been struck by how that scene corresponds to a scene in a film made 26 years later: Deliverance (John Boorman 1972). The scene is towards the end of that film where a graveyard is being evacuated because the whole area is being flooded after the building of a dam. 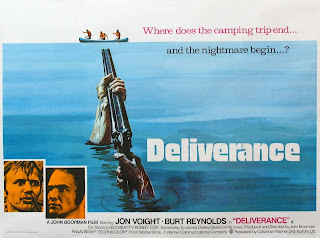 These two films, put together, captures, by a huge ellipsis, the optimism and idealism of an early outpost, bringing civilisation to the wilderness (regardless of how loaded terms civilisation and wilderness are) and the appalling side effects of that optimism and idealism, leading to ecological destruction and desecration. The myth of the frontier comes to an end, and the American dream drowns in its own success. Putting those two films together might not seem to be obvious but there are so many different ways in which to look at film, or study film history, and one such way is from an ecological, or environmental, perspective. My recent post about Wild River (Elia Kazan 1960) did not dwell that much about those aspects of it, but they are a central part of the film and it could easily have been discussed entirely from such an ecological angle. More films than one might think are actually in one way or another about ecological themes, explicitly or implicitly, and across genres. A science fiction film like Them! (Gordon Douglas 1954), one of those 1950s films that are routinely claimed to be about the fear of Communism, is actually about self-inflicted environmental disaster, a harbinger of things to come. Legal dramas such as A Civil Action (Steven Zaillian 1998) and Erin Brockovich (Steven Soderbergh 2000) are about that. Antonioni's Red Desert (1964) too. One central theme in Pale Rider (Clint Eastwood 1985) is how large-scale mining destroys the environment and the livelihood of ordinary people. 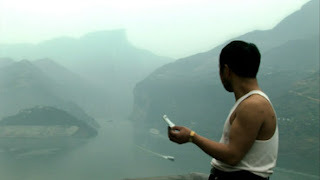 Still Life (Jia Zhangke 2006) is about the devastating consequences of the building of the Three Gorges Dam. 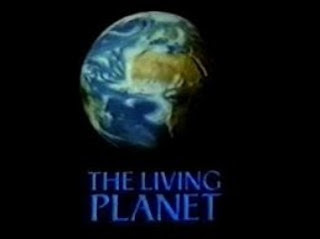 Films on these topics became more common in the late 1960s, in line with the growth of modern day environmental concerns and organisations. (I say modern movements because environmental concerns are much older, and became widespread at least in the late 19th century, which is also when the first modern environmental laws were enacted.) Rachel Carson's book Silent Spring came out in 1962 and was a key development in the current movement, and it also brought new awareness to earlier books on the subject such as Sand County Almanac by Aldo Leopold, published in 1949. WWF was started, in Switzerland, in 1961, Greenpeace in 1971, in Canada. In the US Richard Nixon created EPA, the Environmental Protection Agency, in 1970. (The very same organisation the Trump administration, such as it is, wants to close down or at least de-fund.) In the early 1970s there were a series of science fiction films with an environmental horror story as their basis, like Silent Running (Douglas Trumbull 1972) and Soylent Green (Richard Fleischer 1973). The latter is interesting because it is an early example of a film that deals with the consequences of climate change and the greenhouse effect. But fiction films about climate change are considerably rarer than films about environmental issues in general, and they are inevitably science fiction films. Waterworld (Kevin Reynolds 1995) A.I. (Steven Spielberg 2001), Snowpiercer (Bong Joon-ho 2013), Interstellar (Christopher Nolan 2014) and at least three by Roland Emmerich, the doomsday auteur. But there is no need for a film about climate change to be set in the future. Climate change is happening now, and it is happening faster and faster. There is now a growing interest in academia about films and the environment, especially in relation to climate change. The other week I listened to a talk about that, focused on mountains, called "Filming the mountain: the moving image and deep time in the Anthropocene" by Anna Sofia Rossholm from Linneaeus University. She discussed various ways of looking at mountains, both now and in the past, but also about different contemporary approaches to theorising about film and climate change, and how films can capture climate change and also how the act of making films also contributes to climate change. (Although you can offset it by for example going carbon neutral.) Within film studies and other disciplines there is a field called ecocinema (and variations thereof), which focuses on these topics. Some issues that are discussed are: how does films and filmmakers address climate change; how might films depict our effect on and relationship with our environment; which ways are the most effective to influence people and increase awareness. Alas, for many it seems to be just another excuse to regurgitate the usual suspects such as Heidegger, Foucault and Deleuze. As a film historian I am not particularly knowledgeable about current green cinema, especially not when it comes to documentaries, but I imagine fiction mostly focus on how it affects us humans while documentaries also look at how it affects nature and the earth itself. But an eco-perspective is interesting when looking at film history too, as one important way among many others of looking at films from the recent and distant past. At her talk, Rossholm mentioned the annoying habit of academics of constantly inventing new terms and then arguing about them rather than the actual reality of films (or the environment in this case). I am personally also not really on board with the term Anthropocene, as I feel it is too soon to baptise our present era. That should be for future scientists. But it is still better than other, more ideologically tendentious terms. Here is a link to a recent article by Rossholm related to her talk (in Swedish only). Two edited collections on the subject: Ecocinema - Theory and Practice, edited by Stephen Rust, Salma Monani and Sean Cubitt (2012) and Framing the World: Explorations in Ecocriticism and Film, edited by Paula Willoquet-Maricondi (2010). It is not just at universities that film and the environment are highlighted of course, there are many film festivals around the world with such a focus. Some are linked through the Green Film Network. Our analogue watches are circular, as are sun dials, and we get our days and years because of the circular movement of the earth. Yet we do not actually consider time as something circular but as something linear, a straight arrow. But that might perhaps be because we rarely really think about it at all; who even has the time for that? But there were at least two films last year that played with circular time. Explicitly in Arrival (Dennis Villeneuve 2016) and implicitly in 20th Century Women (Mike Mills 2016). In Arrival the aliens, the heptapods, write and think in circles, and this is also how they experience time. Human beings will too, when they begin to understand them. Then the future has already happened and the past is in the future. They will remember the future as if it was the past, and it will be the past because past and future are the same. Ish. In 20th Century Women the main characters do voice-overs, in the now, talking about their pasts. But sometimes they also speak about their futures as if they had already happened, as if they, like the heptapods, were remembering their futures. My own concept of time is muddled, and has changed over time (obviously). At one point I wondered whether it was like glass, i.e. slowly sliding downwards imperceptibly (glass may appear solid but it is constantly moving, a window is always thinner at the top and thicker at the bottom) but now I do not feel that way anymore. Now I do not know. But nobody really knows what time is, other than that it is something relative. Is it real or unreal? It is related to consciousness, but nobody knows what that is either. It is perhaps wrong to speak of time in singular, there are different kinds of time. There is physical time and psychological time. There is clock time and by the building of the railways and their time tables that time became standardised. Time as a fourth dimension. Then there is time in the sense of deterioration of matter, which is irrespective of the movements of both the earth and the dial. Everything decays (over time) and in this sense everything ages, even rocks. And just think of how weird it is that if you put one watch on a table and another on the floor, right beneath the watch on the table, the one on the floor, being closer to earth's gravity, will show a different time. Your wristwatch will not be sensitive enough to show the difference, but new atomic clocks will. My favourite film by Tsai Ming-liang. 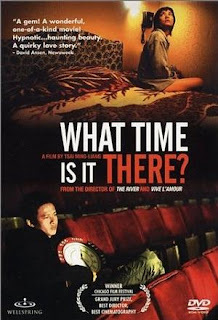 So time fascinates me, and I am always interested in how films and filmmakers use time, or play with it. In Tony Scott's Déjà Vu (2006) time bends in various ways as the film takes place in two parallel times, with the highlight being a car chase where the cars are in the same space but not at the same time. No, better to say that they are actually at the same time, but not in the same time. (You might have to watch it to understand.) Theo Angelopoulos sometimes has different times united in the same shot, past and present joined together within a long take with a moving camera. In Alf Sjöberg's Miss Julie (1951), in some scenes when Julie is remembering her past, that past is shown in the same frame as she is so as she is talking about herself as a little girl, with her dad, that girl, her younger self, is present in the scene together with her dad. Her present person and her past person are together in the same space but not in the same time. The wall of time though means that they cannot communicate. 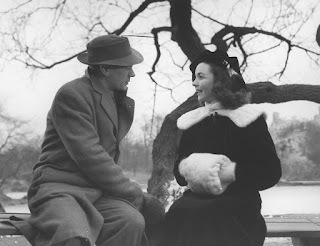 In the beautiful Portrait of Jennie (William Dieterle 1948) that time-wall has crumbled as a woman from the past somehow comes to appear in the same space as a man in the present, and they fall in love across time. Sometimes the length of a film and the time of its story are the same as, famously, in The Set-Up (Robert Wise 1949) and High Noon (Fred Zinnemann 1952), more or less. But this has never in itself been particularly interesting to me. It is more fun with the opposite, like in a scene in The Red Shoes (1948) by Powell and Pressburger when during one take the words "45 minutes later" appear on the screen, so a great deal of time has passed but nothing has changed in the shot, only the time. In Miguel Gomes's Tabu (2012) in a single shot, of a woman sitting down by a pool, the Portuguese word for "September" appears and that is all we see of September. In the next shot it is October, that too just the one brief shot. Here time really flies. Some filmmakers are known for their time games. Alain Resnais of course. Christopher Nolan's Memento (2000) runs backwards, Inception (2010) runs on parallel time tracks and Interstellar (2014) is a cinematic depiction of Einsteinian time (as opposed to Newtonian time). Joseph L. Mankiewicz is the flashback auteur, the flashbacks being a deliberate way of expressing his own idea of time, as he has discussed in various interviews. Howard Hawks on the other hand is categorically against flashbacks, his concern is only the fleeting now. For Hawks, man is superior to time (and to space too). Their different ideas of time are key parts of their artistic projects, and not just for these four. Anyone studying authorship should look at the way the person being studied address and handles time. In La jetée (Chris Marker 1962) time is both frozen and liquid, and so a man can remember being a witness in his childhood, in freeze frames, to how he in the future was killed. Here too time is circular and we have come full circle. "It was only a moment for you, you took no notice." I am currently working on a research paper on the meanings of time and space in the films of Hawks, Ford and Walsh. You may have noticed that I did not mention time travels, but that felt too obvious. Besides, there is a new, good, book about just that: Time Travel - A History by James Gleick. "Things change, and time is how we keep track."